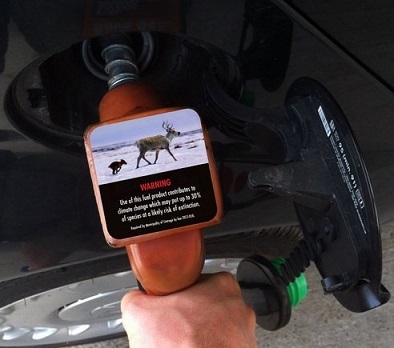 Ever since launching our project to put climate change warning labels on gas pumps, people have frequently told me, "My friend still smokes, so warning labels don't work." They draw a very general conclusion from a very particular example. First, if you want to learn about the effectiveness of tobacco warning labels, you need to look at the studies. Second, if want to learn about the potential impact of our warning labels, you need to look at human psychology and the nature of climate change. There is clear evidence that tobacco package health warnings increase consumers' knowledge about the health consequences of tobacco use and contribute to changing consumer's attitudes towards tobacco use as well as changing consumers' behaviour. They are also a critical element of an effective tobacco control policy. If you're still not convinced by the evidence, ask yourself: Would tobacco companies spend millions of dollars on lawyers to fight labelling laws all over the world if they didn't work? Of course not. Indeed, there is an entire industry that employs psychologists and runs focus groups to tinker with the images, colours, fonts, shapes and textures of packaging -- all with the explicit purpose of influencing consumer choices. It's simply untenable to suggest that the way a product is presented has no effect on consumer attitudes or behaviours. But let's put aside the tobacco analogy for a moment to explore how warning labels on fossil fuels address human psychology and climate change. Also known as current moment bias, hyperbolic discounting is a cognitive bias in which people, given two similar rewards, will show a preference for one arriving sooner rather than later. Translation -- we have a really hard time imagining ourselves in the future and altering our behaviours and expectations accordingly. As such, most people usually opt for gratification now, while leaving discomfort for later -- a serious psychological deficiency when considering the environmental consequences of such a short-term way of thinking. I like to use the analogy of accidentally putting my hand on a hot stove. When that happens, I get an instant pain signal that prompts me to remove my hand. It's an adaptive quality that causes me to adjust my behaviour to a change in my environment. With climate change, there is a delay between cause and effect. We get no immediate signal to alter our behaviour so we fall victim to our cognitive biases. Our resulting decisions are maladaptive. Our warning labels compress time to mitigate the effects of the current moment bias. They bring future consequences -- like drought, the extinction of species, and ocean acidification -- into the here and now. In doing so, they build feedback to help us transition from a maladaptive economy to an adaptive one. Knowing the principle of diffusion of responsibility holds sway in the hearts of many may explain the often frustrating inaction with which we find ourselves faced on an almost daily basis, but it also points the way to changing it. The key is getting others to feel personally responsible for helping to solve problems they may not consider their own. So where responsibility for a problem is diffuse, one must simply locate responsibility. The placement of our warning label on a gas pump nozzle takes a problem of diffuse origins and locates responsibility right in the palm of your hand. Our idea isn't another climate change documentary or vague awareness campaign; the concept is revolutionary. There is nothing out there that connects us to these problems in such a direct way. But let's go back to the warning labels already on cigarette packages for one last bit of psychology: cognitive priming. 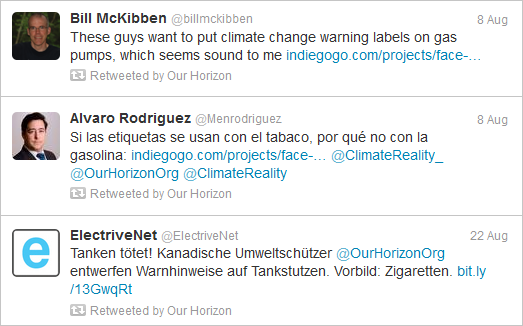 Remember, there are over 50 countries that already have picture-based warning labels on tobacco packaging. When I first came out with this project, my theory was that citizens all over the world would be cognitively primed to understand and advocate for our idea. Early indications via social media appear to validate this theory. And there's more: our gas nozzle labels share a similar size, shape, and look as the labels already on tobacco packages. Priming theory suggests that citizens may develop the same negative associations with fossil fuels as they already have with cigarettes. What sort of impact will this all have? I think these labels have the power to transform markets. That's why I've hired someone to help build the global version of our campaign. Right now we have a database with the email address of all 25,000 representatives at the municipal level in Canada. Through our website, we're empowering citizens all across the country to easily advocate for our idea. When Canadian communities begin to set precedents by passing our idea into law, I want to be ready with the email address of every single elected representative on the planet. We're going to empower citizens all over the world to advocate for our idea. We have already completed collecting email addresses for representatives in several countries, but we still have a lot of work to do. To volunteer some time to help us crowd-source the development of this database, please contact Christine at christine@ourhorizon.org. To donate to our project, please visit www.indiegogo.com/projects/face-the-change.